It’s this really sad story about a girl who has lung cancer. She goes to support groups because she’s depressed and her mum sent her there. She meets this guy called Augustus who has cancer in his leg. They fall in love and stuff, it’s very like teen romance. She has this favourite author, who is the only voice she can relate to. So they fly all the way to go and meet him. They have dinner and she finds out that his cancer has come back… it’s really cute if you’re into sad stories. If you get really sad and cry easily maybe you shouldn’t read it, but I did and still really liked it. Rated: 4.5/5 reallys - "I wouldn’t give the full five because there are only two main characters and I wish there were more little ones to help along the story." 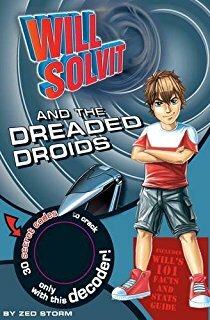 It’s a series where this ten year old boy named Will finds a broken time machine named Morph. Morph, since he’s broken, has a mind of his own. So he takes Will Solvit to a random place and this time he goes to Antarctica. When they arrive they meet a bunch of guys, well I shouldn’t say guys, they’re robo-penguins! The robo-penguins keep sneezing on people (I’m not even joking). Whenever they sneeze on someone they turn into mind slaves. The guy who invented these robo-penguins that sneeze on people is Dr Demonex. The book comes with a decoder device. Throughout the book, there are these squares, which don’t look like anything much, but when you get your decoder (making sure the lines are horizontal) and shine it over the square, it makes a picture. There are 30 squares in the book. Will really wants to join the robo-penguins, because they took his parents as slaves. He is willing to become a slave if it means being with them. It’s really good, but the names are really hard to say and sometimes the plot doesn’t make sense. When I saw this book, I thought it was going to be like… well not penguins! When I saw the title I thought it would be something like ‘moving spikes with a mind of their own’ I didn’t expect sneezing robo-penguins. Rated: 4/5 reallys - "This series is really crazy!" I’ve only read the first three chapters so far. The start of this story is 19 years after the end of The Deathly Hallows. Harry and Ginny have children - one called James, one called Albus and Lily. James, the older brother, keeps on teasing Albus because he is about to enter Hogwarts and be sorted. James taunts him saying “you could be in Slytherin” over and over. On the train he meets a boy named Scorpius, the son of Draco Malfoy. But he’s actually really nice. Apparently now there’s this rumour going on, but they don’t know if it’s true or not, that Draco’s wife is going back in time to have children with Voldemort so that her offspring are related to him. Which could mean Scorpius could be the son of Voldemort and have lots of power. Albus is sorted and ends up in Slytherin!!! Everyone wonders how he can be a Potter and also a Slytherin. The next year Albus starts being really mean to Harry. Apparently it’s cool to not have parents around near the train. I like the book style more where there are lots of descriptions which help to set the scene. So because of that it’s not as good as it could be. It would have been way better if it wasn’t a play and didn’t skip through first year so quickly. Rated: 3.5/5 reallys - "Unlike the other books, I think the movie will be better than the book this time, especially as it is a play." Basically, it’s about a boy named Josh, who’s the seventh son of the supreme overlord of the universe. He has one job, which is to deliver Pi's. These are messages from around the universe that look and smell like apple pies and are embedded with tiny files. They live in the cosmos and are immortal. Every now and then, the worlds might be able to see them, when there’s a break in what keeps them hidden. Josh’s dad has to wipe out Earth. Josh’s best friend’s parents go around on planets studying them and keeping files. Those parents were on Earth because the powers that be (Josh’s dad) said so. His best friend Carl gets wiped out along with his parents as Earth is ripped out of existence. When they all disappear, a girl is standing there. She is the person who looked through the telescope and saw it happen. Josh has the Pi which contains all the files about the earth, right down to the first molecule. With the girl and people from the afterlife, Josh tracks down the really old scientist to help them rebuild Earth. There is a special mist, because in the Cosmos where they live there is no gravity and they aren’t solid. So when they touch Earth they like the solid feeling. The earthling girl can’t breathe in the Cosmos because there’s no oxygen, so she thinks she’s in a dream, which is helped by Josh transforming all the time. Aunt Ray, who makes Pi's, gets water that Carl created which contains oxygen and helps her breathe properly. So she has water poured on her head all the time. 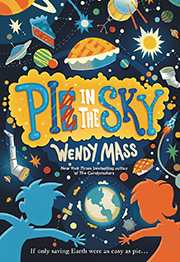 Rated: 5/5 reallys - "I really liked all the scientific ideas and words." This book is full of Egyptian mythology. It’s about this boy named Carter Kane and his annoying sister Sadie. So he travels around with his father because his mother died sometime at Queen Cleopatra’s Needle in London. His dad is Julius Kane and he is a magician. He gets to see Sadie twice a year. Julius takes them to a museum where he tries to bring their mother back to life by chanting with the Rosetta Stone. Hoping to bring the Egyptian gods out of prison who were banished by a group of magicians who thought they were evil, he tries to only release Osiris, the king of the underworld, but instead he releases Set, Nef, Horace, Isis and Osiris. Set locks Julius in a coffin (like she does to Osiris in Egyptian mythology) and sends him away. Carter and Sally are watching, hidden behind a pillar. Their amulets, the Tine of Osiris and the Eye of Horace, absorb part of the spirit of each god. They travel around and meet this girl named Zia and go to the biggest magic spot. Before they get interrupted, Zia tells them all of this magic stuff about all the specialties magicians can have, like statues, divining, combat, healing, animal charming, amulet making and necromancy. Because they’re hosting gods they have to hurry away for fear of execution. Then they set out on an adventure with a godly cat named Muffins, battle Set in Phoenix and attempt to rescue their Dad, but it’s complicated, because he’s now tied to the underworld… filled with spells! Rated: 5/5 reallys - "Interesting, funny and cool!"